198 people in our community are currently praying with you. Then Abram said to Lot, "Let there be no strife between you and me, and between your herdsmen and my herdsmen, for we are kinsmen. Is not the whole land before you? Separate yourself from me. If you take the left hand, then I will go to the right, or if you take the right hand, then I will go to the left." And Lot lifted up his eyes and saw that the Jordan Valley was well watered everywhere like the garden of the Lord, like the land of Egypt, in the direction of Zoar. (This was before the Lord destroyed Sodom and Gomorrah.) So Lot chose for himself all the Jordan Valley, and Lot journeyed east. Thus they separated from each other. Abram settled in the land of Canaan, while Lot settled among the cities of the valley and moved his tent as far as Sodom. Now the men of Sodom were wicked, great sinners against the Lord. Abram sensibly points out that there is plenty of land, and no need for Lot and him to be getting into disputes caused by overcrowding. Lot moved his operation southeast to a plain near the Dead Sea. The delta of the Jordan River is drastically different today than 4000 or even 1000 years ago; it was formerly covered with plant life, in places a jungle of papyrus and palms trees. The Roman historian Flavius Joseph called it "the most fertile spot in [the Roman colony of] Judea". Zoar is a city known to archaeologists, although it might have been so small that it would hardly be called a "town" today; the name, zoar, means "insignificant". It still appears on the our old map of Palestine; you can see it just below the Dead Sea (called "Sea of the 'Arabah" on the map). Today, it is a desolate spot. 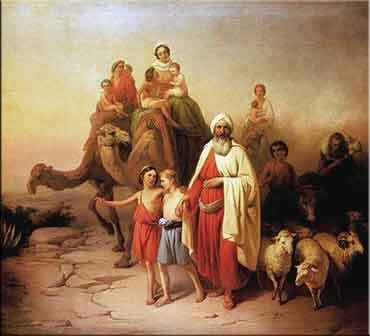 Sodom, the closest city to Lot's ultimate stopping point, will become central to the early events in Abraham's history. The lands of the Negeb east of the Jordan, where Lot has pitched his tent, will eventually come under the rule of the Moabites and the Edomites, and later, the Kingdom of Jordan. They were never part of Israel or Judah.